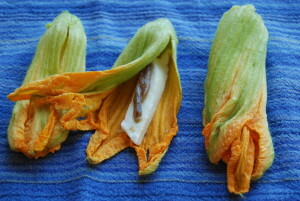 The vegetable garden is growing, it’s not yet time for tomatoes, but there are salad, zucchini, and my favorite: zucchini flowers! Gently dip the flowers in cold water then drain them and put them to drain on a dry cloth with which dry them gently; take off the stem slightly apart the flowers with your fingers and remove the pistil, careful not to break them! Once cleaned fill with mozzarella and anchovy fillet. Meanwhile, prepare the batter: put the flour and the red of the egg in a large bowl, gradually add the water, stirring with a whisk to avoid lumps. Once you obtain a smooth, add salt. Place a large skillet heat the peanut oil. 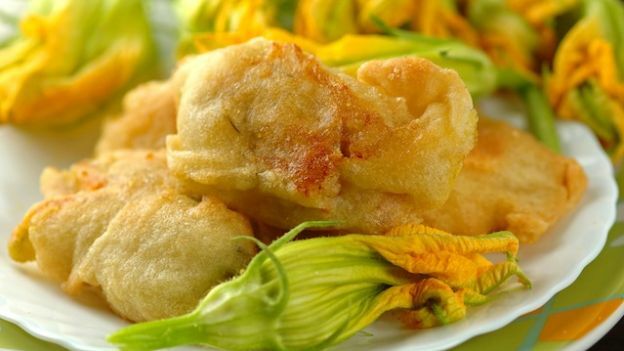 At this point gently wrap the flowers in flour , than in the batter, one by one, trying not to break them and immediately immerse the flower in hot oil. When they are golden brown, drain and let them dry on a tray lined with paper towels. Eat them hot.